The main goal of DiscoverU career-related activities is to expose students to the vast variety of careers available in our region. Since 2016, the Community Center for Education Results has partnered with Challenge Seattle, a private sector initiative led by CEOs from 17 regional companies and organizations and former Governor Christine Gregoire, to elevate career exploration through Worksite Tours. Throughout 2017, the team has been building tools to support schools and employers to host and implement high-quality worksite tours. 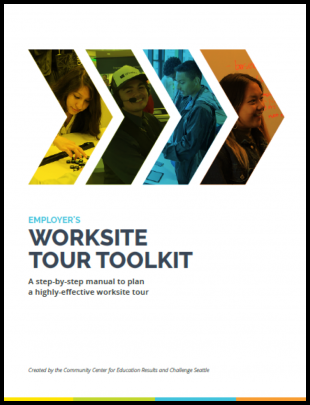 A guide for schools to prepare for worksite tours. Focused on school content like parent permission forms, chaperone preparation and student worksite tour follow-up. The 2017 DiscoverU Student Design Team was featured in three training videos created to support employers, chaperones, and students. Learn from students who have attended worksite tours how you can prepare!